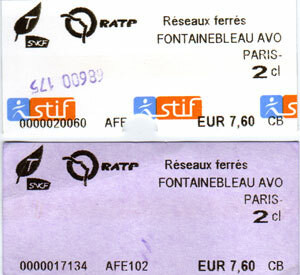 A RER Ticket is known in Paris as a Billet Ile-de-France, a small coupon like train ticket for Paris and surrounding Ile-de-France region priced for the length of the trip, calculated from departure station to arrival station. Calculate ticket cost from station to station here. For example, if you were to buy a train ticket from Charles de Gaulle Airport to Paris, you’d buy a RER ticket / billet Ile-de-France, at a cost of for adults and for children 9 & under (). These tickets are purchased from SNCF/Transilien/RATP RER/Metro ticket windows and ticket vending machines (Billetterie Ile-de-France) at large train stations (gares such as Gare de Lyon, Gare du Nord), and at RER and Metro stations. 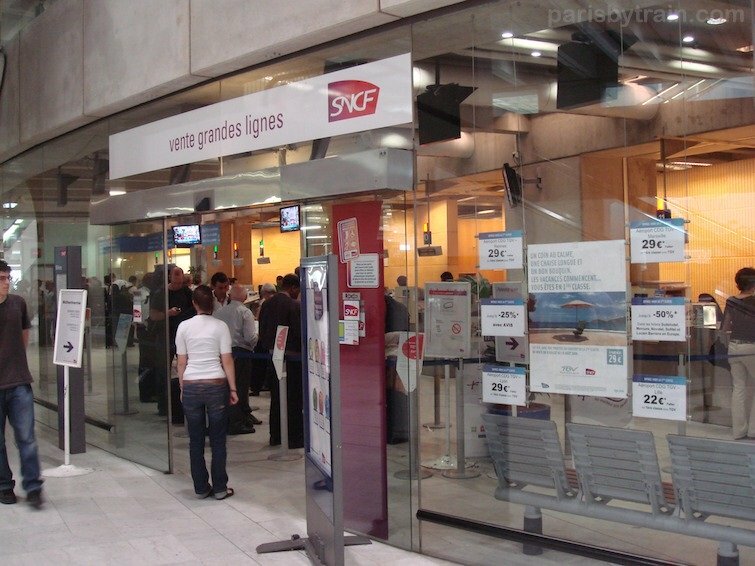 At train stations there may be several types of ticket windows, one selling RER ticket / Billets Ile-de-France, and others selling tickets for the Grandes Lignes, tickets for TGV and other types of intercity trains. Grandes Lignes ticket windows cannot sell you billets Ile-de-France, so keep this in mind before queuing up to buy train tickets. 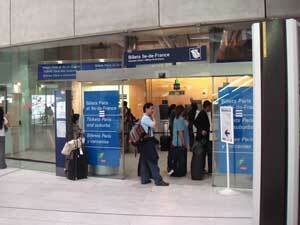 Above is a RER Ticket / Billets Ile-de-France ticket office. This is a Grandes Lignes (TGV, etc.) ticket office. When buying a RER ticket / billet at a ticket window you can usually just say the word “billet” [“bee-yay”] and the destination such as Paris [“Par-ee”], Aeroport Charles de Gaulle [“Ere-oh-porh Sharl-duh-gall”], Versailles [“vere-sigh”]. Often ticket sellers speak English, at least enough to understand where you’re going. A one way ticket is known as an Aller-Simple [“Al-Eh somplh”]. Round trip ticket, which are simply two one way tickets, is an Aller-Retour [“Al-Eh Ray-tour”]. A RER ticket / billet Ile-de-France allows connections or transfers to be made onto Metro or RER trains when arriving at Paris. Transfers onto buses or trams however, are not allowed. For those modes of transportation, you’ll need a new Paris Ticket T+.